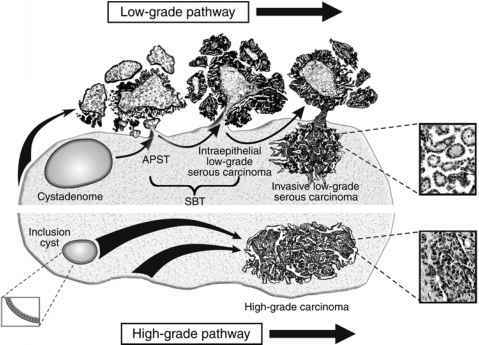 Careful scrutiny of endometria with (invasive or noninvasive) papillary serous carcinoma has disclosed a lesion with histology and genotype intermediate between normal glands and serous carcinoma. EGD lacks the wild cytological atypia of serous EIC, has only patchy or moderate abnormalities of p53 staining, and a mitotic activity somewhat less than associated carcinomas (56) (Fig. 6, Panel A). Frequent occurrence, in up to 53% of uteri with serous carcinomas, is as expected for a precursor lesion. EGD tends to be multifocal, involving luminal surface epithelium, sometimes within endometrial polyps. Molecular analysis of allelic losses within individual patients has shown progressive incremental deletions in the spectrum from normal to EGD to serous carcinoma, thereby confirming a stepwise relationship among these phases of disease (57). The frequency of EGD occurrence outside a cancer context is unknown, and a histological phenotype easily confused with reactive changes complicates its reliable identification. Clinical outcome studies of patients with isolated genotype-confirmed EGD is needed to define the natural history of this lesion and its place in patient management.